You are busy! Try this personal assistant. We all know how busy educators are. Wouldn't it be nice if you had your own personal assistant on your laptop? Many people use siri on their phone and this tutorial is similar to Siri. Since a majority of our teachers have a macbook, you might find this tip worthwhile. Instead of typing that next email or document, how about using dictation? You will need to be a fairly quiet space to do this. Dictation does not work well in noisy settings. Here is a quick tutorial, perhaps you would like to give it a try. 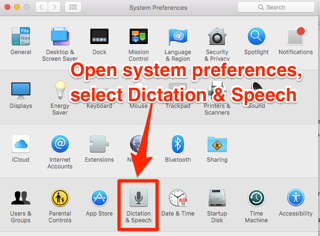 Open System Preferences, select Dictation & Speech. Turn on Dictation and set up your options. Check the Use Enhanced Dictation box. This will download a file so you can dictate without an internet connection. Choose the keyboard shortcut you will use to signal that you’re ready to start dictating. The default is pressing the function Fn key twice, which I find convenient and I can remember it. You will find the Fn key on the lower left of the keyboard. Choose your preferred microphone from the pop-up menu below the microphone icon. Normally, you use the internal microphone but it works very well to use earbuds that came with your phone, that little bar on the cord is a mic and does a nice job of filtering out background noise. Press the keyboard shortcut (Fn Fn twice) for starting dictation. Or choose Edit > Start Dictation. 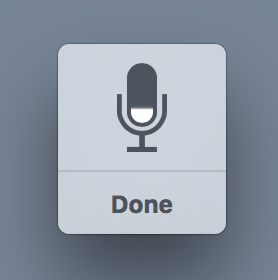 When your Mac is listening, it displays a microphone. Speak the words that you want your Mac to type. 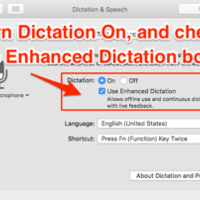 Use dictation commands to add punctuation, formatting, and more. In other words say comma, person, new paragraph, etc. To stop dictating, click Done below the microphone icon, or press Fn. 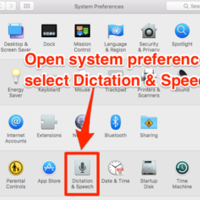 Dictation learns the characteristics of your voice and adapts to it. The more you use it, the better it gets! I use dictation to write part of this tutorial and it worked! SO, it isn't perfect, I do need to change use to used, but I will try enunciating clearly to see if it improves. 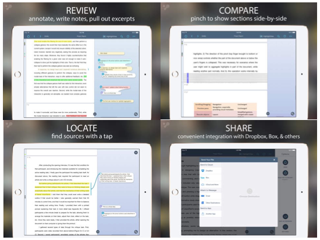 LiquidText, an App Store Editors’ Choice, improves the way you read, annotate, and research on the iPad. LiquidText is a free App for researching, annotating, and highlighting your documents, websites, and PDF’s. Read in ways not possible on paper. LiquidText gives you the tools to focus on what matters, compare distant sections, take notes, build upon thoughts, and pull out key facts from the text. Improve the way you read on the iPad with LiquidText. LiquidText gives users a personalized reading experience, ideal for comprehensive reading, through intuitive interactions that allow the user to compare sections by squeezing a document, pull out key passages, organize ideas, find context, and more. Do you love fonts? Free Fonts? A little different direction for the resource this week……42 FREE Teacher Fonts from Tech Junkie. If you are anything like me, you are always looking for a new font to use in a creation (handout, presentation, bulletin Board, etc.) and the standard fonts on your computer have more or less worn out their welcome. I’d consider myself the font queen, I don’t even want to tell you how many fonts I have. It is only in the last few years that fonts have become free for download. I am all for artist getting paid for their hard work, however, I also appreciate it when they freely share their beautiful creations. I saw a tweet about the Tech Junkie website this morning via Twitter & Pinterest and discovered 42 FREE Teacher fonts. What an awesome find. I have been to this site many times, but today I really dug in and found tons of resources. And I have only scratched the surface of what is available on the Tech Junkie site. I encourage you to check out the Tech Junkie site. You can even be featured on their site…. Want to share your blog posts or be an author? You’re in! Check out how to get featured on this site and your articles will go out to THOUSANDS of readers daily through email and social media networks.? So if you are looking for a new font for a creation, here you go. http://www.teachjunkie.com/blog-files/42-free-fonts-teachers/ Pin the site to your Pinterest or bookmark it so you can find Tech Junkie again. Tech Junkie describes their site as……. "Welcome to the place for teachers to share bright ideas, creative lesson plans and activities! Join in and take a look behind the scenes. Return regularly to find featured tips, ideas and activities that help make being a teacher inspiring!" 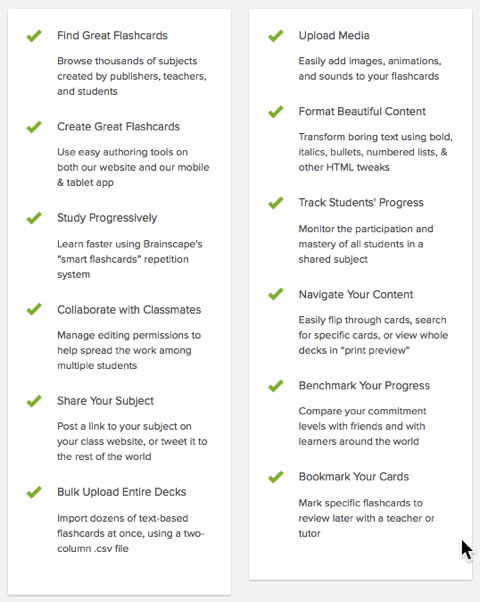 Check out these flashcards on steroids! Academic studies have proven the efficiency of spaced repitition. Nobody has ever made reviewing with flashcards as personalized as Brainscape. Brainscape's innovative "smart" flashcards work in timed intervals that a user rates on a scale of 1 to 5. Brainscape then uses an adaptive learning algorithm to differentiate instruction and display the flashcards the user needs to practice. This is a great way to learn difficult subjects and break down difficult concepts. An added bonus is the user can crowdsource flashcards to find pre-made cards or make his or her own. Perhaps digital reviewing may work well for your class. Here is a shout out to Cyndi Danner Kuhn for sending this review of Grammarly! Thank you, Cyndi! Grammarly is an online grammar and spelling checker that improves communication by helping users find and correct writing mistakes. It’s easy to use: Copy and paste any English text into Grammarly’s online text editor or install Grammarly’s free browser extension for Chrome and Safari. Grammarly’s algorithms flag potential issues in the text and suggest context-specific corrections for grammar, spelling, and vocabulary. Grammarly explains the reasoning behind each correction, so you can make an informed decision about whether, and how, to correct an issue. It works in a variety of ways from your browser (Safari & Chrome). You can upload your paper, or copy and paste the text, although there are size limit on papers, so you might have to upgrade to premium. Grammarly works on almost every web page to check your spelling, grammar, tone of voice, and more! While typing a blog post or composing a tweet, Grammarly s checking my English. Clicking on the Grammarly icon shows not only spelling errors but grammatical errors passive voice, punctuation and more… much more! Grammarly not only tells me for example, that I have passive voice but gives me the option of a tutorial to learn what it is. Clicking on the error, or suggestion makes the changes in my blog post or tweet for me or even in my Canvas course site! What the difference in the FREE and Premium. It is a better deal to purchase for a year and….So far, I have only used the free version, and it is very handy, but I am seriously thinking about the Premium, it has some features I believe would really helpful. 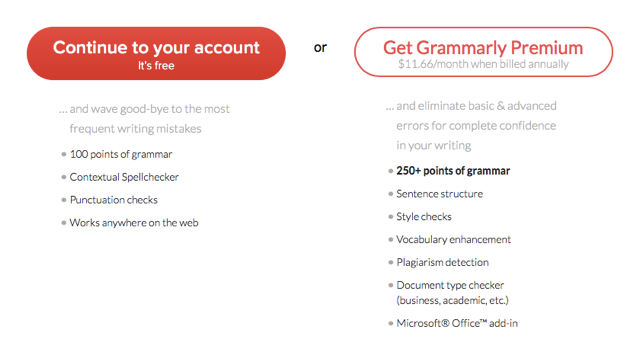 If you’re not fully satisfied with Grammarly within 7 days, we’ll refund 100% of your purchase price! Grammarly can operate as a spellchecker in the background, but the full proofing interface is much more capable and complex than just the red squiggly line. Garmmarly helps you by taking small, distracting grammar issues out of the document before you share. Stunning visual stories, newsletters, book reports, newsletters! Adobe released Slate for the iPad last spring and it is FREE. Take documents and bring them to life! Adobe Slate is a fun and easy way to turn any document – a lesson, newsletter, book report or presentation – into a stunning visual story, in just minutes. Slate elevates your content and allows you to look like a professional designer. Choose a theme and gorgeous fonts will match, magazine-style designs and motion automatically transforms your story – guaranteeing a marvelous read on any device. Each Slate story you publish is simply a link. No unrelated content, no random ads — just your story. You can share it via text message, email, social media or embed it where you want on your own website. Anyone can view your Slate and it will look great, whether they're using a phone, and iPad, a tablet, or computer. Find out more on the Slate website. Slate, is an extremely powerful communication tool that can be invaluable in the classroom — An easy way to share your knowledge and express creativity in visual essays, reports, journal entries, portfolios, book reports, science projects and more. Ditch that Powerpoint! Through a simple link to the web, you can share your ideas and knowledge with the world. Principal Jennifer Bessolo has been using Slate for her weekly staff newsletter. Reach out to her if you would like to see some examples. Many educators have been impressed with the ease of use of Google for the classroom. Google has become wildly popular in classrooms across the nation, yet there are some things we, as educators, need to assist our students with as they use Google tools. I have curated some of my favorite articles and a Google Cheat Sheet tool created by Kasey Bell to assist you as you utilize Google in the classroom. I love to be organized, but it does not always come easy for me. Here is a great organizational tool I use daily to keep all my websites categorized and organized. 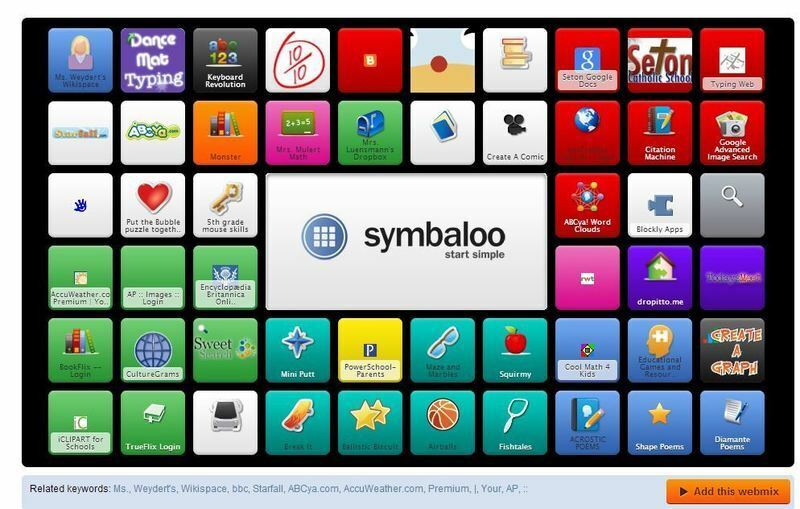 Symbaloo is a visual social bookmarking tool that saves me time and keeps me organized. I have created several symbaloo webmixes such as: great educator websites, school district sites, dissertation resources, and professional learning (I recently started creating a webmix for the conferences and meetings I attend). In the past, I have collected tools at meetings only to forget where I put them. Now, I add them in my symbaloo while I am attending the meeting and Viola! I have the resources at my fingertips! Symbaloos are also searchable. Educators can search for symbaloos that are already created and full of great resources, saving precious time. Some educators create symbaloos for their classroom so students can quickly find sites with one click! 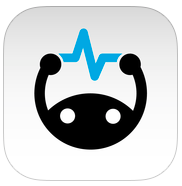 Symbaloo is also available as a mobile device app and is great for iPad users.